The power of a glass jar to dominate a still life painting resides in the tension of the transparent container with the contents. Glasses of wine are common components of still life paintings, but a filled container is more challenging, as can be seen in Weissbort’s striking Arrangement with a loaf, a jar of red peppers & white linen on a shelf[q.v.]. Other artists who have used this motif include Miguel Parra (1784-1846), Still life with walnuts, olives in a glass jar, a partly-peeled lemon & a glass of wine, and the Hungarian Romek Arpad (1883-1960), many of whose compositions are based on arrangements of glass jars. 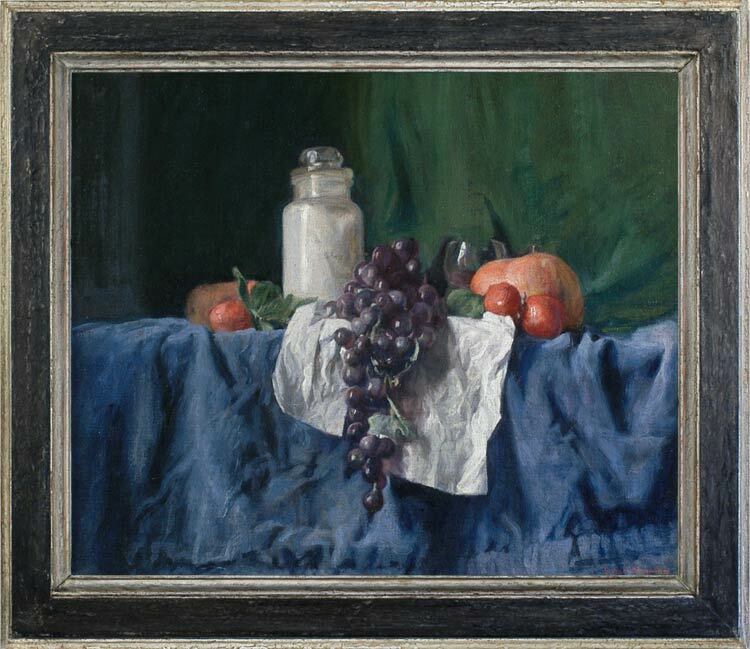 Here Weissbort uses the strong white note of the jar of salt, together with a white napkin, to lift a still life built out of abstracted areas of dark, rich colour – lapis blue, bottle green, purple and soft red, Within this pattern, the different textures are set against each other – the soft pile of the fabric, the smooth gleam of fruit, the transparency of glass, and the powdery roughness of salt seen through the sheen of the glass.